No wonder that this island as Mediterranean and further east of our country (Spain) has winemaking tradition. Indeed in the chronicles of the conquest of the island in the thirteenth century, there was talk of the wine produced on earth and probably Phoenicians and Romans used the Mahon harbour great for trade and certainly among the goods went into the sea had wine from the island. Menorca is a fairly flat island, with land dedicated to crops primarily devoted to supply the beef cattle, which abounds on this island. In times of a British colony, you have surely make wine distillates as the British used for their espirtuos beverage, came from local vineyards. 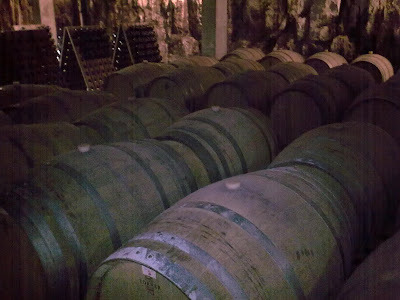 At present there are nine wineries, with an area of at least 30 hectares, producing wines in various parts of the island. The island has terroirs sandstone, a limestone very fragile, soils are also cluster to the north and south areas of sandstone. On my vacation I stumbled upon one of the largest wineries, Binifadet, a winery can be visited and which produces about 50,000 liters. of different varieties. Before visiting, by chance, I was in Ciutadella, the city's west end of the island in a place called Sa Fideuera, where I enjoy a young Binifadet Syrah and Merlot red wine very fruity and easy drinking. When visiting the cellar I found a modern building, the surrounding fields of vineyards and found an impressive range of wines, from rosé Cabernet Sauvignon, Syrah and Merlot, very special, with primary aromas of fruit, a type sparkling brut basis of this same wine, a white Chardonnay with aromas of citrus and a fine palate. The 2004 Merlot, with 12 months in French oak is also a special wine, it shows red and black fruit ripe aromas of vanilla, mineral undergrowth and a touch that makes it quite different. The winery can be visited and also makes other products like jams wine, dulce de Moscatel, olive oil of Arbequina and vinegar of Chardonnay and Syrah. A surprise in my vacation, so no surprise that the camera and I forgot I had to do the photos from my mobile, so I could collect my visit clearly graphically, but the senses if they were nice. Heiner Sauer, German winemaker, created a winery in 1987 the Pfalz, the German Palatinate in the Rhine valley, an area near the border with France. The German tradition of cultivation of white grapes and one of the best areas for growing Riesling and Gewurtztraminer varieties and varieties incorporating 'Burgunder' make this winery produces wines from its 17 ha. following the German tradition of more than 1000 years old. Harvesting is done by hand with various types of selection, always seeking the highest quality grapes. 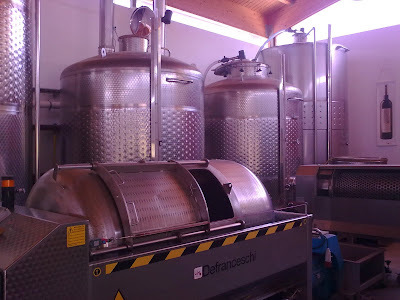 The winemaking is achieved with modern techniques to extract the maximum exponent in aromas and flavors, but with the traditional view of time and quiet to give the wine to develop gradually. 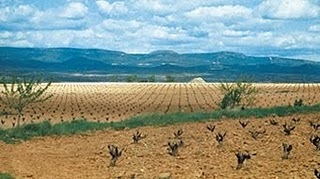 In Utiel-Requena, Heiner Sauer bought some land in order to produce red wines with Mediterranean character, because in Germany it was very difficult to get acclimatized varieties, its climate and soil types. Bodegas Palmera In particular, the name of the winery on Spanish soil, has 14 ha, south-facing south-west, in the municipality of Utiel, where we can find a fabulous and old strains of almost 50 years Tempranillo, Bobal, Cabernet Sauvignon and Merlot, planted recently. Here are vinified red wines with character, taking advantage of soil and climatic differences between day and night, at a height close to 700 mts. and less than 100 km from the Mediterranean. Klaus Lauerbach, the winemaker is responsible for controlling the vineyard and the production of these wines, combining these varieties for wine as special as L'Angelet D'or, a Red Guard wine with 20 months in French oak barrels and a grape rigorous selection on process and only when exceptional vintages occur. L'Angelet, Capricho and Viña Cabriel are the three wines, with special selection, which develops in Spain Bodegas Palmera, remained at 90% of production dedicated for export. For varieties produced in Germany, the white, I have to emphasize his great Rieslling and above all a 'Burgunder' made from Pinot Grey, whose structure in the mouth makes it different from the typical targets of the area.